Explosives detonate near IDF forces patrolling Gaza border, severely injuring four soldiers. 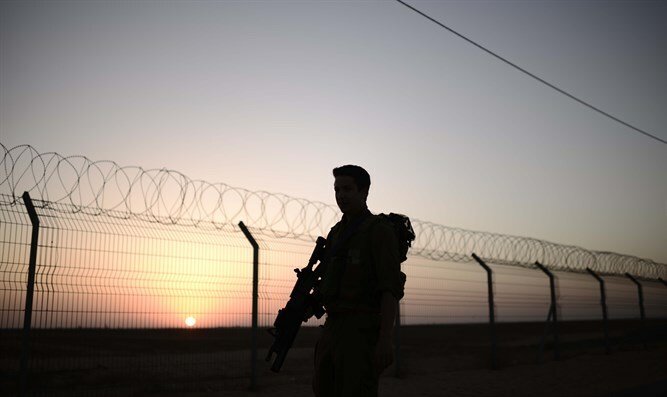 A hidden roadside bomb detonated Saturday afternoon near IDF Golani Brigade forces patrolling the Gaza-Israel border fence. The soldiers approached a flag attached to the fence, setting off the bomb, which seems to have been buried there during Arab protests, which acted as cover, on Friday. An IDF source said the detonation occurred at 3:40p.m. In a statement, an IDF spokesperson confirmed that two IDF soldiers were severely injured in the blast. A third IDF soldier was lightly injured in the blast, and a fourth was moderately injured. All were transferred to Soroka hospital in Beer Sheva for medical treatment, where the two severely injured soldiers underwent surgery. All the soldiers' families were notified of the incident. Shortly after the attack, the IDF retaliated by attacking a Hamas base located just over the Gaza border, near where the explosion occurred. The source emphasized that residents should continue their regular routine and that there are no special instructions at this time. The IDF's Gaza Division is evaluating the situation. In a statement, the Eshkol Regional Council said, "In response to the queries regarding the security incident, we emphasize that this was a military event occurring near the border. Other than the fact that the explosion was heard in nearby towns, the incident has no effect on the towns and instructions to residents have not changed. Things are still normal." Israeli Prime Minister Binyamin Netanyahu responded, "Today's incident on the Gaza Strip border is serious. We will respond appropriately. I send my wishes for a quick recovery to the wounded." Two weeks ago, IAF planes attacked two terror targets at a Hamas military base in southern Gaza, after a rocket was fired at the Sha'ar Hanegev Regional Council a day earlier.